Joker Extreme is licensed under a Creative Commons Attribution 3.0 Unported License. Permissions beyond the scope of this license may be available. Posted to Flickr on 08 June 2013. This is the sixth in a series of photos that show two extremely different interpretations of the same DC Comics character. 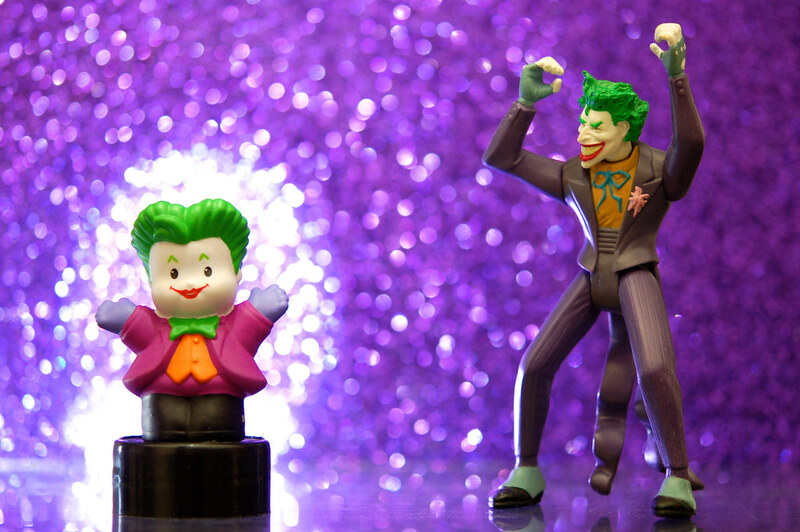 The figure on the left is Joker from the Fisher-Price DC Super Friends line of Little People toys, released in 2011. The figure on the right is Joker from the Legends of Batman line of action figures, released in 1994. The sculpting is consistent with the Joker as seen in the comics books of that time. At Christmas in 2012 my wife gave me a set of Fisher-Price DC Super Friends Little People, designed for very young children, as a kind of gag gift. But of course she also suspected I would likely involve them in a photo at some point, and she was correct. During the 90s comic book creator Todd McFarlane captured the attention of the toy market with several lines of ultra-realistically sculpted action figures. The success of McFarlane Toys prompted other manufacturers to “buff up” their super-hero toys. I thought it would be fun to create a photo series comparing and contrasting that style of action figure with their Little People counterparts. I chose the Legends of Batman Joker figure because although he does not have a lot of articulation, the sculpt allows for an energetic-looking Joker when you position his arms in the air. Also, I like the wild hair and extreme angles given to this figure in contrast to the pudgy Little People Joker. This photo was posted to Flickr on 08 June 2013. It was one of 500 images featured on Flickr Explore for that day. The last time I checked, it had 31,874 views on Flickr. Joker Extreme by JD Hancock is licensed under a Creative Commons Attribution 3.0 Unported License. Permissions beyond the scope of this license may be available.